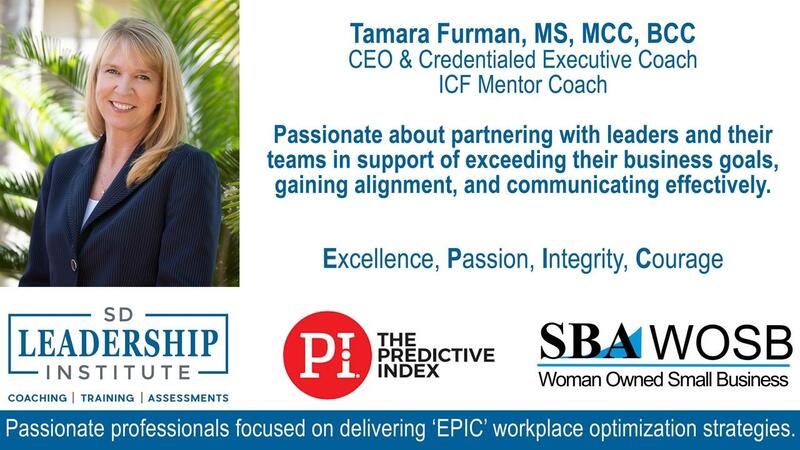 As the CEO of SD Leadership Institute and an ICF Credentialed, Master Certified Executive Coach, Tamara brings close to 30 years of hands-on professional business experience; 20 years at the senior and/or executive level. SD Leadership Institute focuses on and specializes in Leadership and Executive Coaching, Team and Group Coaching, a wide-variety of Assessments and Leadership Development coursework and workshops. Most of the coursework and workshops are rooted in gaining self-awareness, building confidence, navigating conflict, developing emotional intelligence, and understanding behavioral motivators and values. Tamara has successfully helped private and public business entities, city, county and federal government agencies, public and private education, non-profit organizations and individuals in a variety of industries, such as financial services, sports and entertainment, healthcare, pharmaceutical, bio-technology, legal, publishing, staffing, manufacturing, consumer goods, hospitality, electronics/technology, digital marketing, education, food service, and retail/e-tail. Tamara has coached both male and female clients in executive level roles such as CEO, President, CFO, COO, CTO and CSO as well as clients in a variety of VP and Director-level roles. She has coached individuals as well as groups and teams on a wide-variety of topics such as: emotional intelligence, increasing confidence and courage, building a more effective and aligned team, becoming a more effective communicator/influencer, becoming a better listener, increasing self-awareness, managing up more effectively, successfully navigating conflict, building executive presence, working more collaboratively, becoming a better delegator (letting go and trusting others), becoming more strategic, preparing for the next level, shifting from functional to enterprise leader, transitioning careers, and more. Tamara has helped organizations overcome some of their most difficult people-related challenges. She has done this through evaluating and assessing individuals and teams, then helping them through the process of redefining, reframing, and realigning how they accomplish their work. She partners with executives and teams to successfully navigate workplace dynamics in order to make the transition from a group of individuals who are stuck, disengaged, compliant and mired in dysfunction to a team of professionals producing results with a commitment to overcoming obstacles through mutual trust, respect, alignment, and collaboration. Tamara has successfully helped individuals, teams and groups in private and public business entities, city, county and federal government agencies, public and private education, non-profit organizations and individuals in a variety of industries, such as financial services, sports and entertainment, healthcare, pharmaceutical, bio-technology, legal, publishing, staffing, manufacturing, consumer goods, hospitality, electronics/technology, digital marketing, education, food service, and retail/e-tail. Tamara has coached both male and female clients in executive level roles such as CEO, President, CFO, COO, CTO and CSO as well as clients in a variety of VP and Director-level roles. Tamara takes the commitment to client confidentiality seriously, therefore, she does not disclose the names of clients on the Internet or in printed materials. A big part of her commitment to client confidentiality is the ICF Code of Ethics associated with client confidentiality, the other element of her commitment stems from her decision to avoid leveraging any client brand to build her business. She believes it’s simply the right thing to do, regardless of the ICF Code of Ethics. The only time a client’s name is disclosed, is if there is a request for a reference, and in that case, she contacts current clients and obtains their permission in advance of connecting them with prospective clients. Within the Code of Ethics, which governs a coaching credential, the International Coach Federation (ICF) requires coaches to maintain the confidentiality of client information obtained during the course of the coaching relationship. Tamara would be pleased to share this information during the pre-engagement process as it relates to the prospective client’s objectives. Board-Certified Coach (BCC) through the Center for Credentialing and Education, Inc.